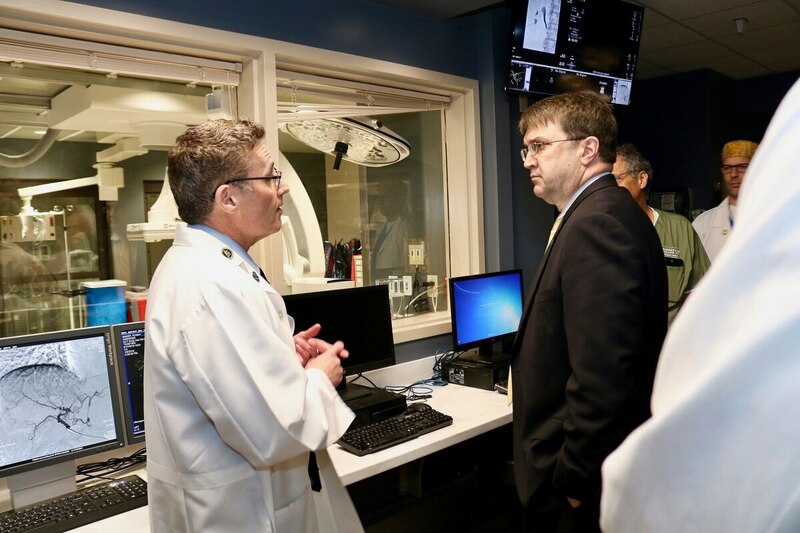 Veterans Affairs Secretary Robert Wilkie, right, speaks to health care officials at the VA North Texas Health Care System in Dallas about technology and patient care during an Aug. 29, 2018, visit. The Senate is expected to confirm a new chief information officer in coming weeks. (Photo courtesy of VA). WASHINGTON — A key remaining piece of business for the Senate in the final weeks of the 115th Congress will be confirming a new head of technology issues for Veterans Affairs, a post that has come under greater scrutiny with the ongoing problems processing GI Bill benefits this fall. A vote on the nomination of James Paul Gfrerer, picked to be the next chief information officer for the department, could come as early as next week, when the Senate returns from Thanksgiving break. His appointment process has been non-controversial thus far, but became more urgent in recent weeks as lawmakers began questioning problems with VA information systems that have contributed to delays in payouts of thousands of GI Bill stipends this semester. “We’re in a mess here because [VA’s] IT doesn’t work,” said Rep. Mark Takano, D-Calif., at a House Veterans’ Affairs Committee hearing earlier this month. He blamed the “debacle” in part on questions surrounding the information technology office’s management. Camilo Sandoval, the former data operations director for Trump’s presidential campaign, took over the role last month. Gfrerer, a Marine Corps veteran, was nominated by the White House in late July and easily approved by the Senate Veterans’ Affairs Committee in mid-September. The biggest obstacle to his final approval has been the congressional schedule, since the mid-term election scuttled all but a few weeks of work over the last two months. But getting a permanent replacement for the CIO post has become an ongoing saga for the administration. Since the last assistant secretary — LaVerne Council — stepped down in January 2017, the position has been filled by a series of acting officials, raising questions about the stability within the department. In April, current acting CIO Camilo Sandoval took over the post, and his appointment drew immediate concerns among congressional Democrats. Sandoval, an Air Force veteran, served as the data operations director for Trump’s presidential campaign and was linked to the controversial use of private social media data by the consulting firm Cambridge Analytica. Administration officials have defended his appointment, calling him an expert in innovative financial technology. In recent months, Sandoval has overseen work on transitioning the department’s electronic medical records to the same system as the Department of Defense, an ambitious project expected to take more than a decade and $16 billion to implement. Lawmakers have also expressed concerns with management of that project, noting that multiple lower-level posts handling that work are also vacant. Robert Worley, a retired Air Force general, will become the executive director of the Houston VA Regional Office in January. Though the timing suggests Worley’s reassignment is a result of the GI Bill payment delays, the VA has not confirmed the correlation. Department officials have said all of the work remains on schedule. They’ve blamed the GI Bill processing problems on outdated technology and overly complicated processing requirements instead of a lack of leadership within the agency, but they have also pushed for faster action on Gfrerer’s confirmation. At his confirmation hearing in September, Gfrerer said among his top priorities would be “stabilizing” the department’s technology platforms. He also promised more accountability within his office and regular communication with lawmakers on progress of major department initiatives. The Senate for now is scheduled to meet for three more weeks before the end of session in December. But that timeline could change based on confirmation votes and other business.